Patriarch Kirill of the Russian Orthodox Church is a powerful reactionary figure in the country's toxic political scene, which has welded a tale of thwarted imperial destiny to a thin-skinned fundamentalist theology that can't bear the slightest sign of mockery; he's blamed ISIS on secularism and Pride parades and says that marriage equality literally heralds the imminent apocalypse. 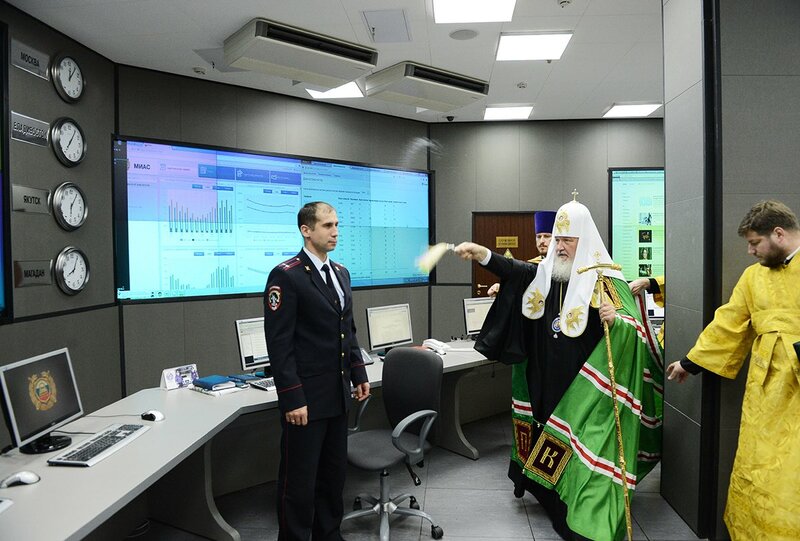 So there's a lot of context behind this photo of Kirill spraying holy water on sensitive Russian government computer systems to fight the Wcry ransomware worm (coating computers with holy liquids is an Orthodox thing, sometimes necessitating the use of paint-rollers to reach out-of-way machines) (to be fair, there's also Donald Trump's bizarre fantasies about using pig-blood-dipped bullets to execute his religious enemies). As Hemant Mehta at the Friendly Atheist points out, the real nexus of this photo is the government official with the "you've got to be kidding me" expression, who exists in a power-structure that requires solemn professions of belief in this powerful weirdo's dumb rituals (including, but not limited to, spraying electronic devices with water, and not because a computer that has been rendered inoperable due to electrical faults is incidentally and thoroughly immune to malware). It bears an eerie similarity to the unguarded facial expressions of Vice President Michael Pence as he does his daily impression of a dashboard bobble-head, nodding convulsively as Trump says things that everyone in the room knows to be horribly wrong, uninformed, and dangerous.